The Off-Campus Meal Plan has been designed to specifically meet the unique needs of college students and their parents in the college environment. It is a flexible meal plan that allows students to eat at a diverse selection of restaurants very close to campus, dormitories, and off-campus housing. Upon choosing a meal plan, a personalized card is issued to the student. 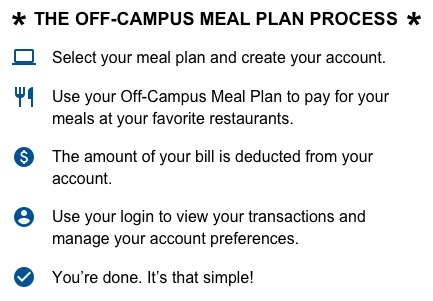 From this point on, the card can be used at all of the OCMP Meal Plan affiliated restaurants. The card is then scanned by the restaurant and the value of the meal is deducted from the total number of meals on your account. It's that simple!!! OCMP restaurants offer members exclusive discounts & deals for being card holders. Please select your campus to see all deals. The Off-Campus Meal Plan is dedicated to insuring that your experience with us is entirely positive. The OCMP representatives are available 24 hours a day, 7 days a week to answer questions, solve problems, help with your plan choice, replace lost or stolen cards, assist with adding meals to your account, and to take suggestions for additional restaurants and services. There is no automated phone system, no voice mail, and all phones are answered by a live person… all the time. The Off-Campus Meal Plan is committed to providing the highest level of quality, diversity and service available anywhere. Through extensive research, The Off-Campus Meal Plan has recruited your favorite restaurants to offer cashless payment, special promotions, and distinct diversity. At The Off-Campus Meal Plan we are continually updating and adding new restaurants to our list. OCMP is a private company and serves the needs of students attending colleges and universities throughout the united states. Unless otherwise indicated, OCMP does not have a direct relationship with the colleges and universities of whose students we serve.